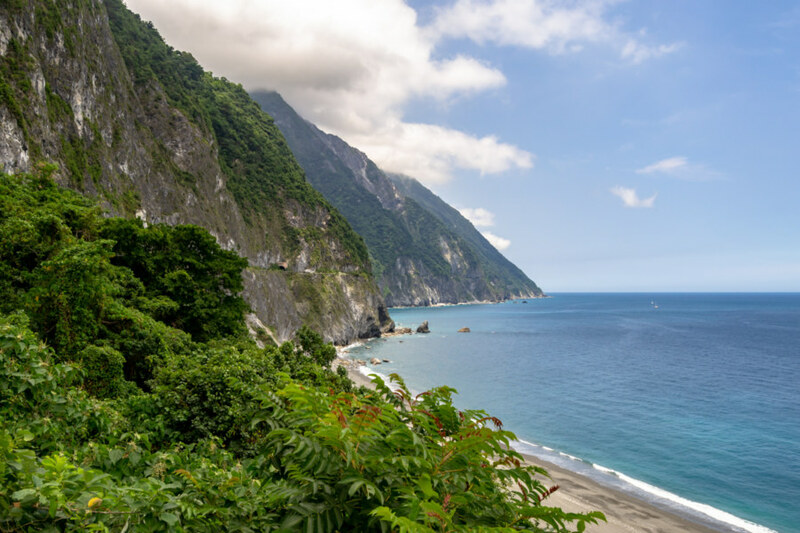 In May 2018 I seized an opportunity to ride the beautiful and dangerous Suhua Highway 蘇花公路 (中文) from Hualien City 花蓮市 to Sū'ào 蘇澳 in Yílán 宜蘭. I had previously taken this same route on bicycle back in 2013—a harrowing trip I’ll never forget—so I was eager to drive a scooter and experience it at a different pace. 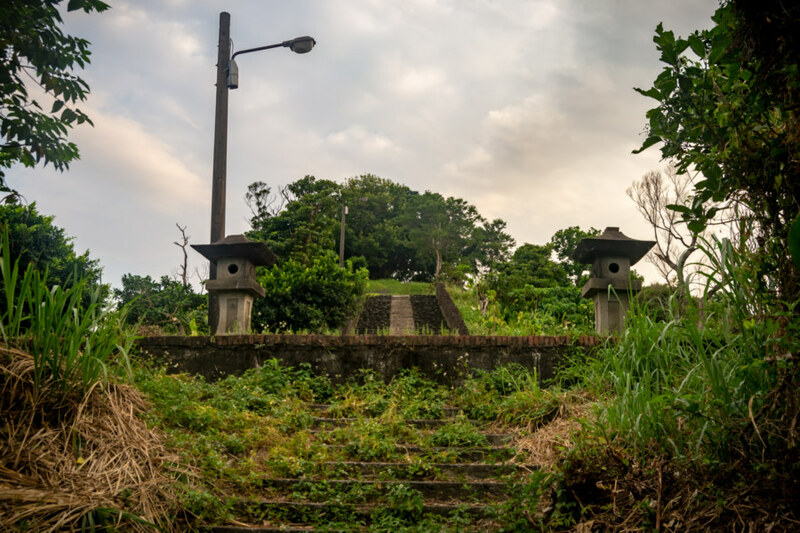 I also visited a number of historic sites along the way, including several former Shinto shrines, as part of an ongoing project documenting various elements of the Japanese colonial legacy in Taiwan. 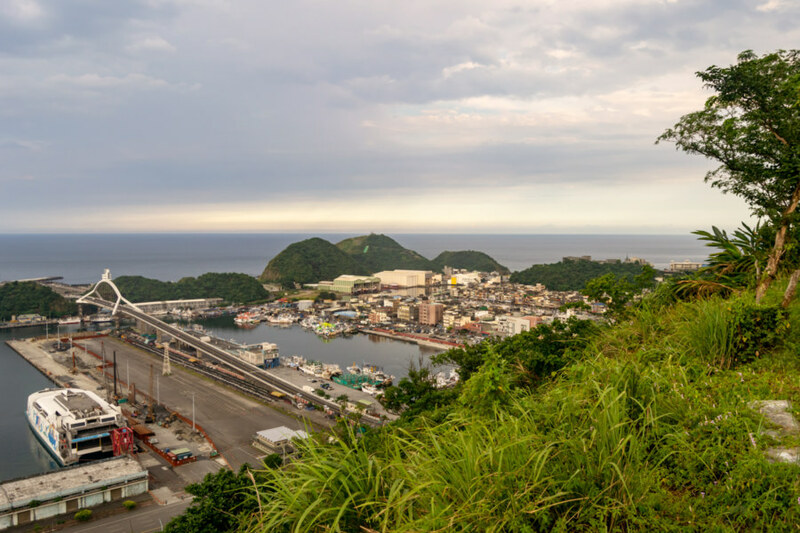 The highway itself also owes something to Japanese engineering—it opened to vehicular traffic in 1931—although it has been continuously repaired and expanded since then. 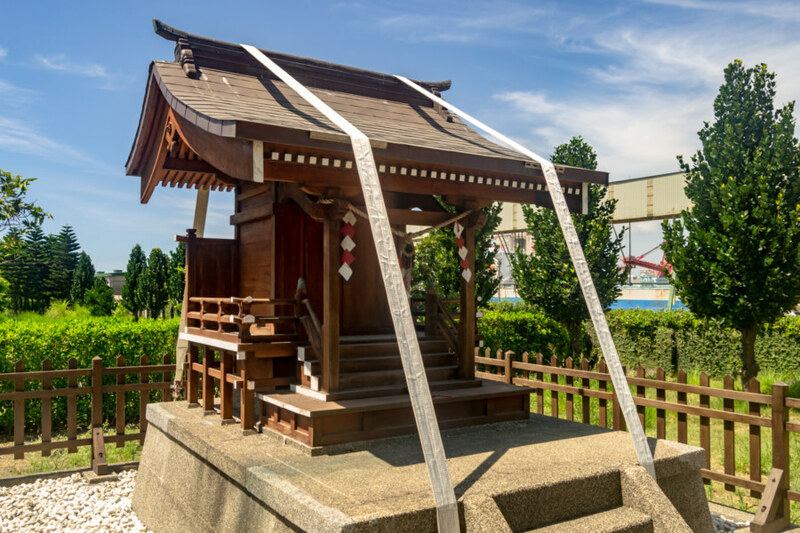 A former Shinto shrine fancifully restored by the Taiwan Fertilizer Company. My first stop as I exited Hualien City 花蓮市 was a Shinto shrine1 located next to the Port of Hualien at the north end of town. In the late 1930s an aluminum factory on this site to support the Japanese war effort. 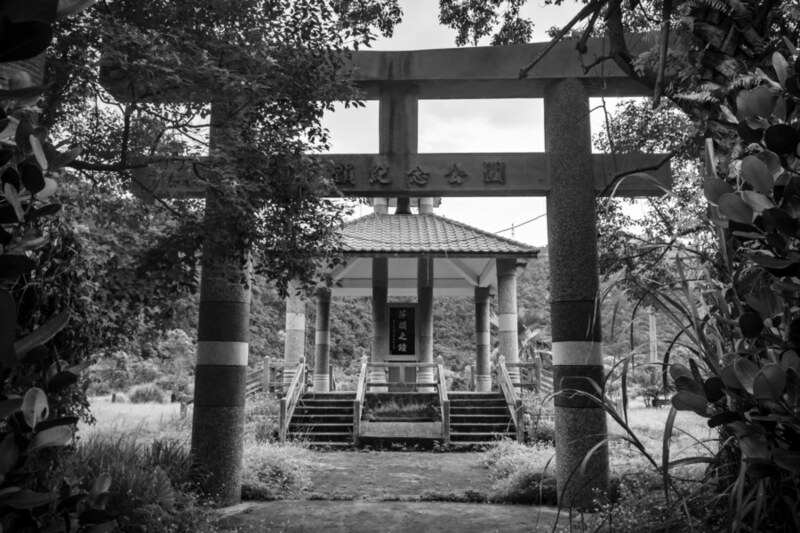 Sometime around 1941 a small, unranked shrine2 was constructed next to the main office. The factory was bombed by American forces but the shrine survived the war, presumably unscathed, although few records of the original shrine are known to exist. Apparently we don’t know what it originally looked like nor what kami (spirits) were venerated there. 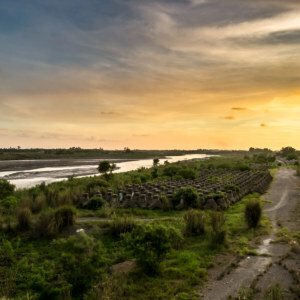 The factory was acquired by the Taiwan Fertilizer Company sometime after the war and the shrine was destroyed, leaving only the concrete base seen in this blog published in 2011. 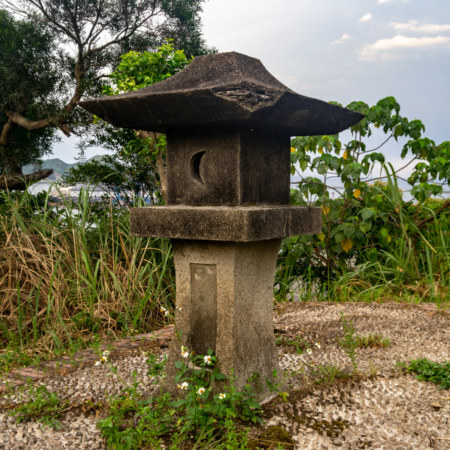 Some sources I consulted suggest a storm might have ripped the shrine from its foundation but it is far more likely it was dismantled after the promulgation of a government edict requiring the removal of Japanese imperial relics in 19743. Much to my surprise I found the shrine recently restored, part of a larger effort to transform the Taiwan Fertilizer Company’s newly-built deep ocean water extraction plant into a tourism factory4. 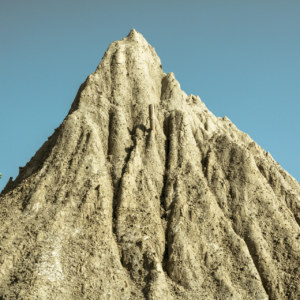 The restoration project, completed in 2015, was informed by clues derived from what remained of the base, photos and records of similarly-sized shrines, and a general understanding of construction methods of the time, but the historical accuracy of such projects is often a matter of debate5. That being said, this replica serves as a useful model for identifying several features common to small Shinto shrines across Taiwan. The base of the shrine is mostly original but the wooden housing is completely new. 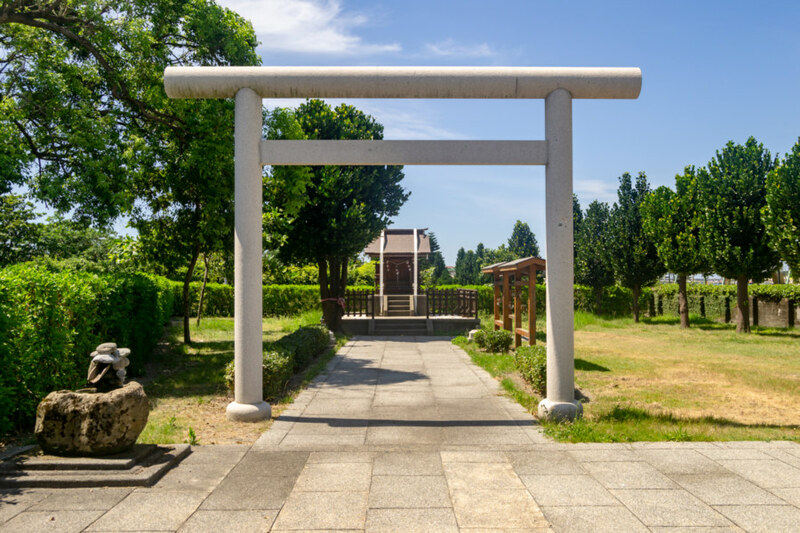 This reconstructed shrine features a torii 鳥居 (the traditional arched gateway), chōzubachi 手水鉢 (the stone and bamboo washbasin used for ritual ablution), a short sandō 参道 (visiting path), ema 絵馬 (little wooden plaques used to convey wishes to the enshrined kami; this replica was never consecrated so these are just for show), and a honden 本殿 in the nagare-zukuri 流造 style (held in place by winch straps, presumably to prevent it from blowing away in a typhoon). A pair of stone lanterns visible in pictures of the opening ceremony were nowhere to be seen. Also missing are the customary pair of komainu 狛犬 (guardian lion-dogs), although I’m not sure such a small shrine would ordinarily feature any. A famous film studio in Xincheng, the small town at the entrance to Taroko Gorge. 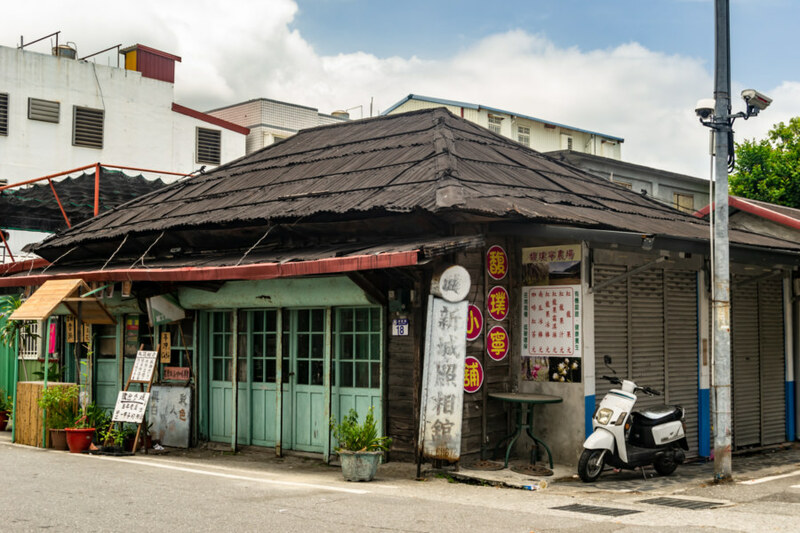 Heading north from Hualien I merged with Provincial Highway 9, formally embarking upon the Suhua Highway near Jǐngměi Station 景美車站, and made my way to the old street at the heart of the small town of Xīnchéng 新城6, the gateway to Taroko National Park 太魯閣國家公園. 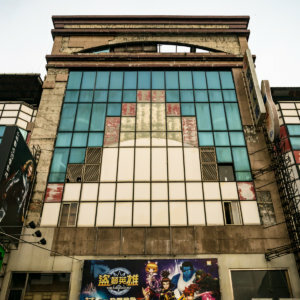 Here I made a brief pitstop at the rustic Xincheng Film Studio 新城照相館, a century-old building featured in the film Eternal Summer 盛夏光年, but it wasn’t open. Next door is the Jiāxìng Fruit Ice Shop 佳興冰果室, famous for its lemonade. I picked up two bottles for the long ride ahead. 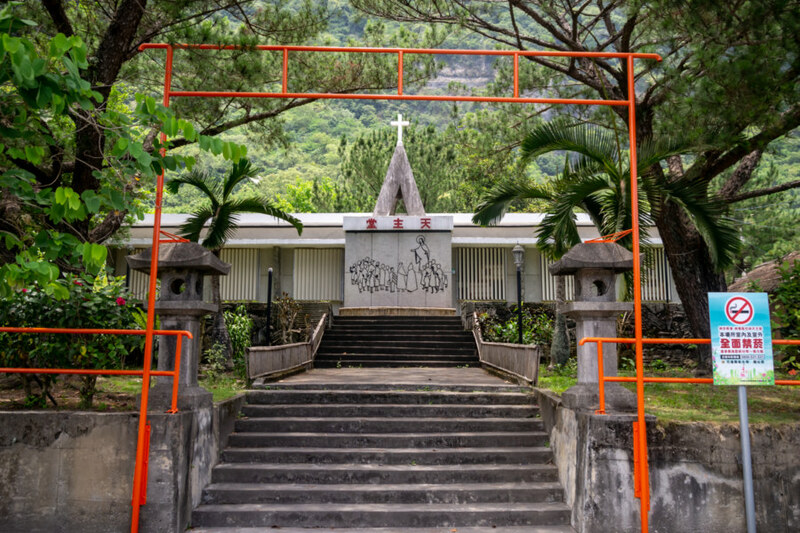 The former Shinto shrine in Chongde, just north of the entrance to Taroko Gorge, is now a Catholic church. After a brief excursion to confirm the location of an old sentry post next to the railway line at the edge of town7 I crossed the Taroko Bridge 太魯閣大橋 into Xiùlín 秀林 and continued north to St. Bernard Catholic Church 聖伯納天主堂 in the village of Chóngdé 崇徳. The entrance to this church features two stone lanterns from the former Shinto shrine in this area, about which little is known8, and a crude orange torii made out of metal pipe. Qingshui Cliffs and the Suhua Highway. 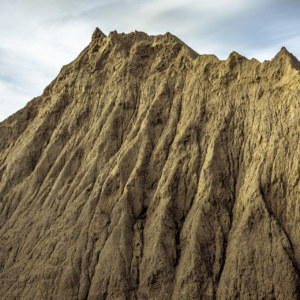 Look closely and you’ll notice a notch running along the cliffside; that’s the highway! 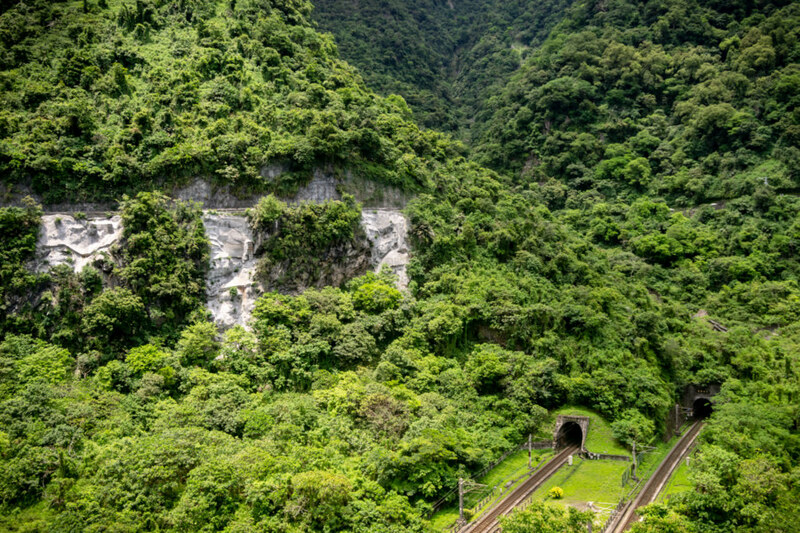 Immediately to the north of Chongde is one of Taiwan’s most majestic landscapes, Qīngshuǐ Cliff 清水斷崖9. 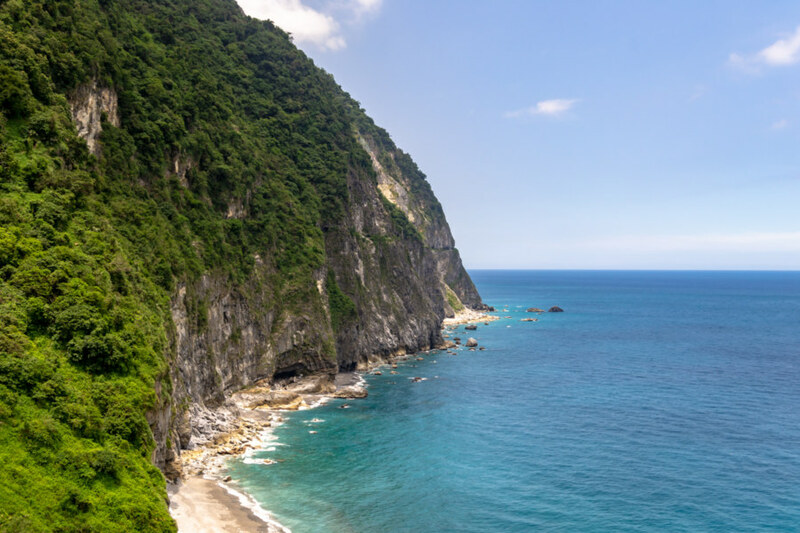 These beautiful gneiss and marble cliffs rise from the deep ocean to the Qingshui Mountain peak, 2,408 meters above sea level but only 2 kilometers from the shore. 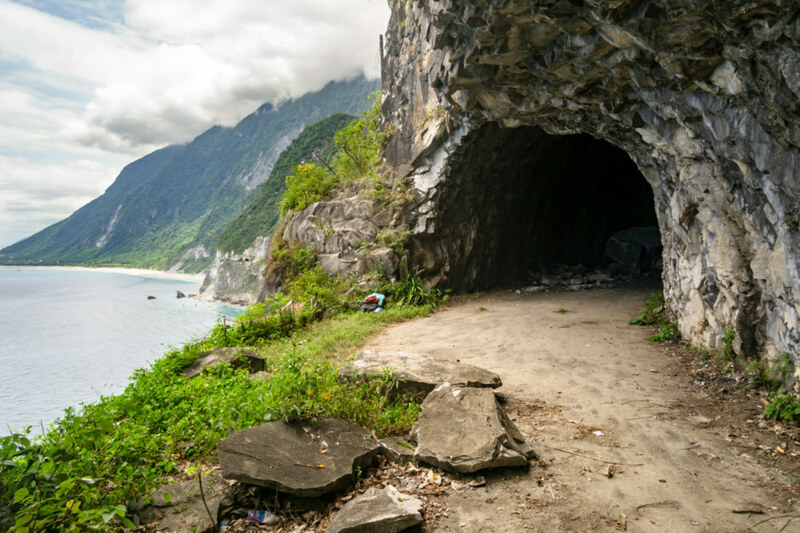 The old Suhua Highway ran along the edge of these cliffs, following the winding contours of the coastline, but many of the most precarious sections have been bypassed with tunnels built over the course of the last several decades. 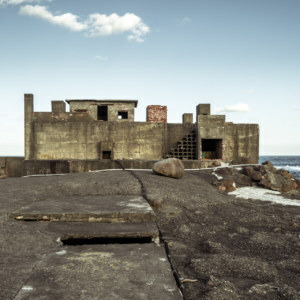 Some of the abandoned sections are accessible but most are not—and without any maintenance, parts of the old road have collapsed into the sea10. Xiaoqingshui Lookout 小清水休憩區, located on the far side of that first tunnel while heading north, provides public access to a short section of the old highway, and many travellers stop here to get a better view of the cliffs. From here you can appreciate the immensity of the mountains rising from the deep ocean and the insignificance of the works of humankind. Both the highway and the railway line are impressive engineering achievements—but they are dwarfed by the scale of nature here on the very edge of the continent. 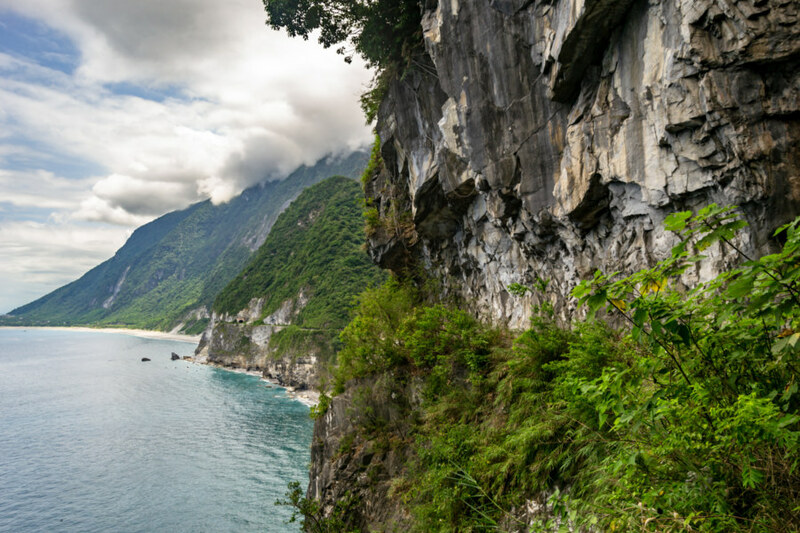 The view from one of the main roadside stops along the Qingshui Cliffs. Both the highway (notice the tiny white vehicles at far right) and the railway lines required incredible feats of engineering and constant upkeep to span more than 100 kilometers of terrain like this. The Suhua Highway dates back to Japanese times but the railway line running along this far shore was not completed until 1979. Formally known as the North-Link Line 北迴線, it was one of the Ten Major Construction Projects 十大建設 promulgated by Chiang Ching-kuo 蔣經國. 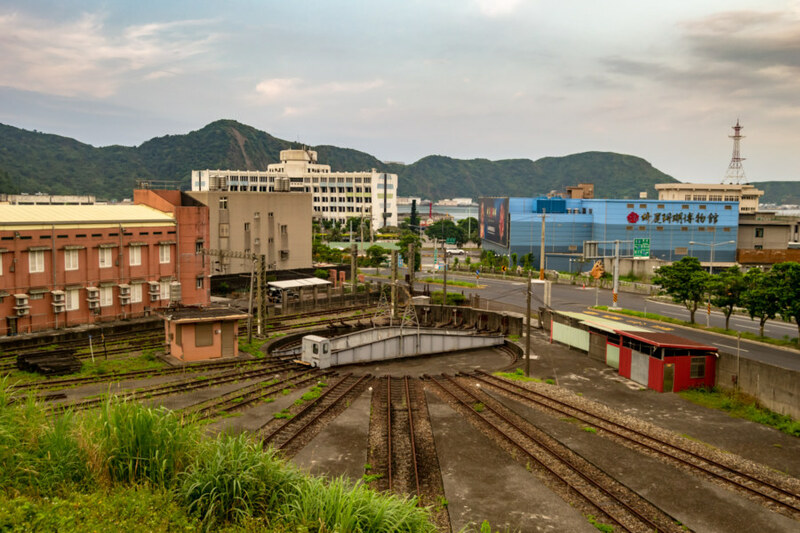 Prior to the opening of the North-Link the railway network terminated at Su’ao Station 蘇澳車站; the railway lines of East Taiwan, which date back to the 1910s, were totally isolated from the rest of the country until this link was established. Another gorgeous view looking north along the Qingshui Cliffs. If I’m not mistaken this section of the highway is abandoned, and traffic now flows through tunnels along this especially precarious coastline. Looking south toward Chongde from an abandoned section of the old Suhua Highway. An abandoned section of the old Suhua Highway around Qingshui Cliffs. Up until the 1970s this is what most of this part of the road looked like! This boulder wasn’t here the last time I was. What was meant to be a leisurely trip up the Suhua Highway with ample time for detours became somewhat more constrained by a change in the weather. Not long after leaving Xincheng the forecast worsened, and the chance of rain edged closer to certainty as I continued north. I had no interest in driving in a storm so I ended up taking fewer discretionary stops than originally intended, which is just as well, for progress was not as swift as planned. Part of the ongoing Suhua Highway improvement project. Construction work continues all along the highway, part of an ongoing improvement project that began in 2011, partly in response to a deadly landslide in 2010 that claimed 26 lives. 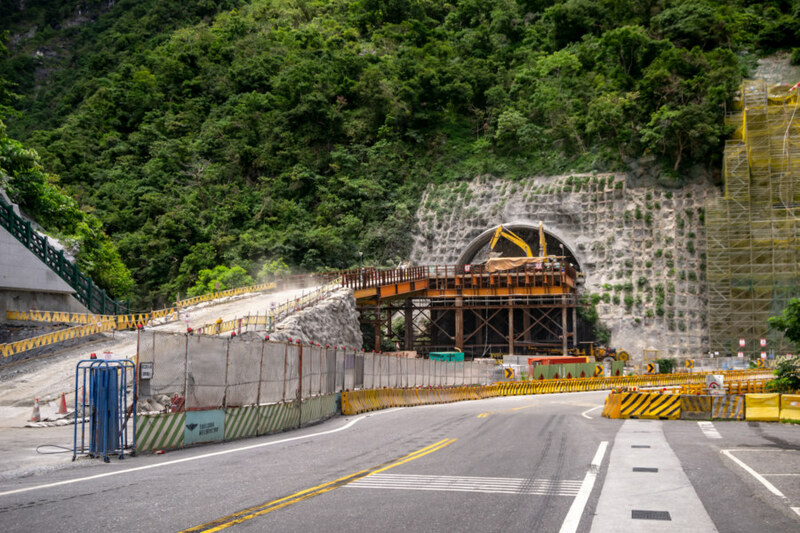 Several of the most landslide-prone sections of coastal road are being replaced by tunnels, nearly 25 kilometers in all. 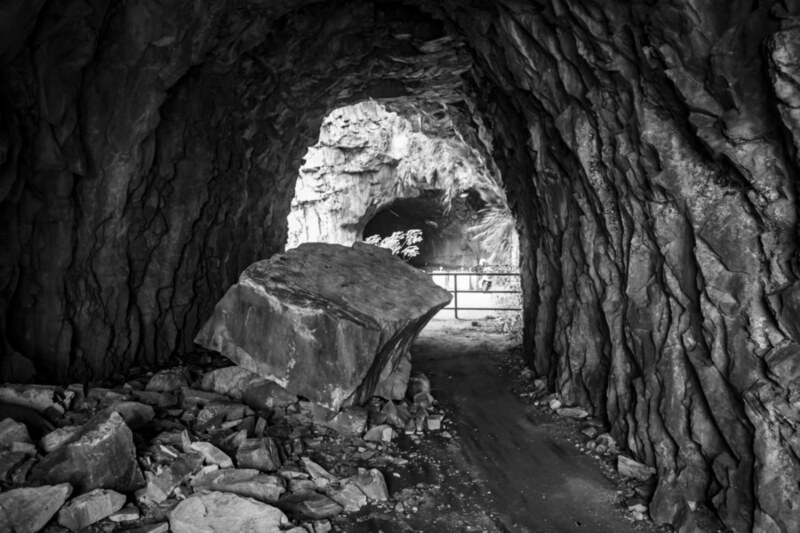 Other areas are being reinforced, ideally to prevent the collapse of sheer rock faces and the like. 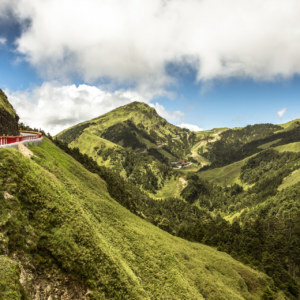 Although this may sound worrisome, the Suhua Highway is far safer than it was decades ago, when it rightfully earned a reputation as one of the world’s most dangerous roads. 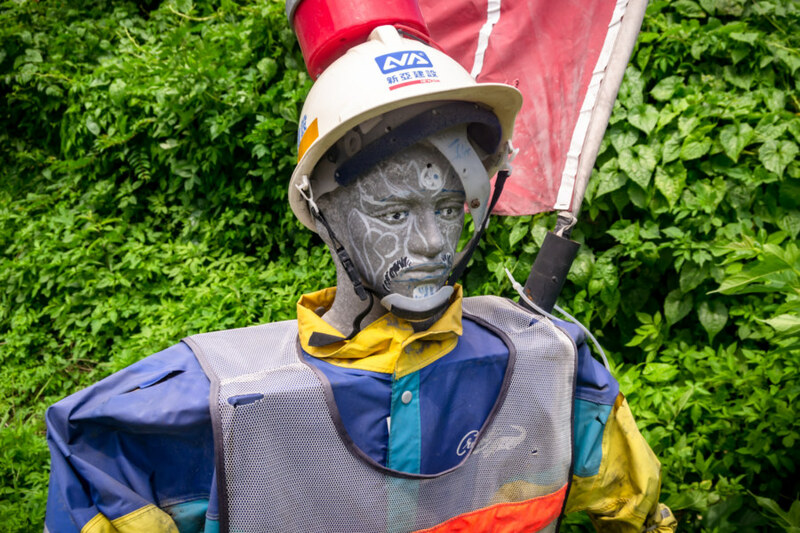 Roadwork dummy at the Hualien-Yilan border. Maintaining and improving the Suhua Highway is a never-ending job. 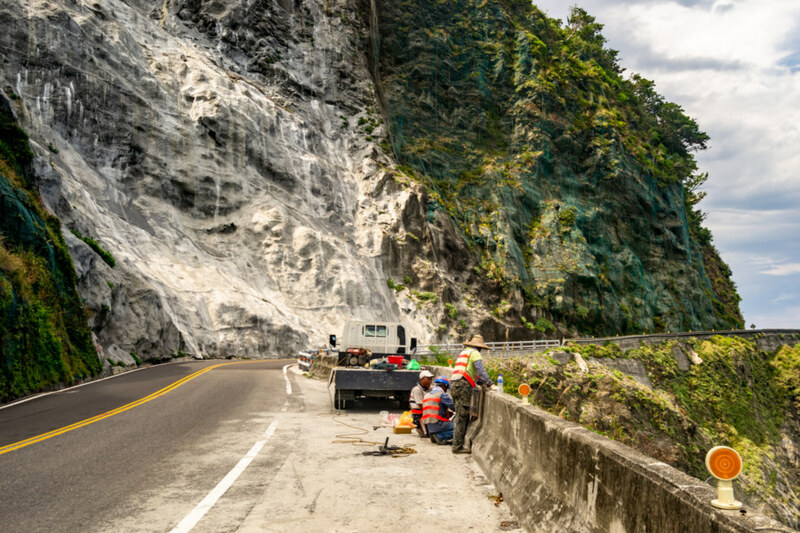 Here some road workers take a break next to a sheer rock face reinforced against landslides. For most of its history the Suhua Highway had long sections that could only handle one-way traffic. Into the 1980s there were six control stations along the highway to control the flow of traffic in each direction. Motorists had to queue and wait for others to pass before proceeding to the next stop. This can be seen in archival footage, starting with this video shot in the 1930s, not long after the opening of what was then known as the Seaside Highway 臨海道路. This video (only on Facebook) shows highway conditions in 1973 from a coach bus, the most common way to get to and from East Taiwan in those days. This system was only abolished in 1990 after the completion of another major road improvement project. This roadside temple is a relatively recent addition to the highway, as this boulder only landed here in 1993. 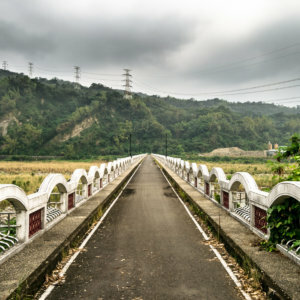 One of the first landmarks you’re likely to see after crossing into Yilan is the Guanyin Stone 觀音石, named after a waterfall located near this bend in the highway. This boulder tumbled down the mountainside and landed here in 1993, only meters from a bridge that surely would have been destroyed on impact. 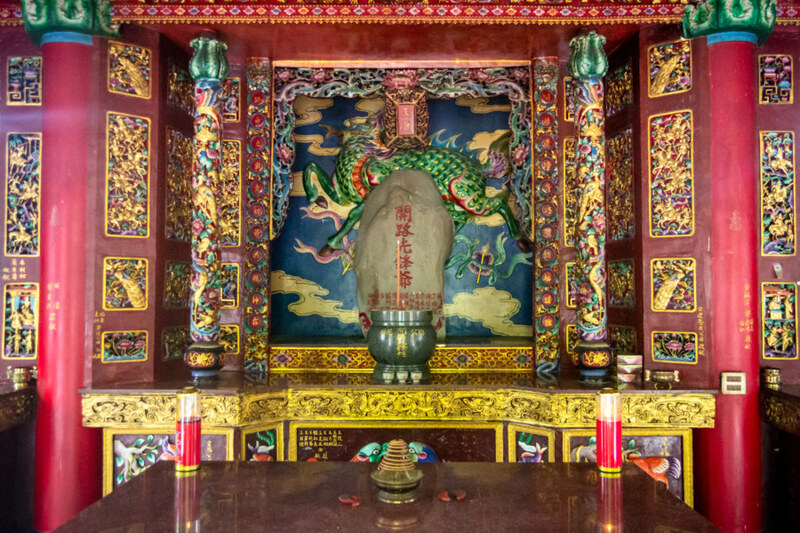 It has since been converted into a small shrine to Guanyin, popularly known as the goddess of mercy. Many motorists stop here to pay their respects—but this lonely stretch of highway, 18 kilometers in all, will become obsolete as soon as the new Guanyin Tunnel 觀音隧道 enters into service in 2019. A monument to Sayon’s Bell next to the rest stop in Wuta. 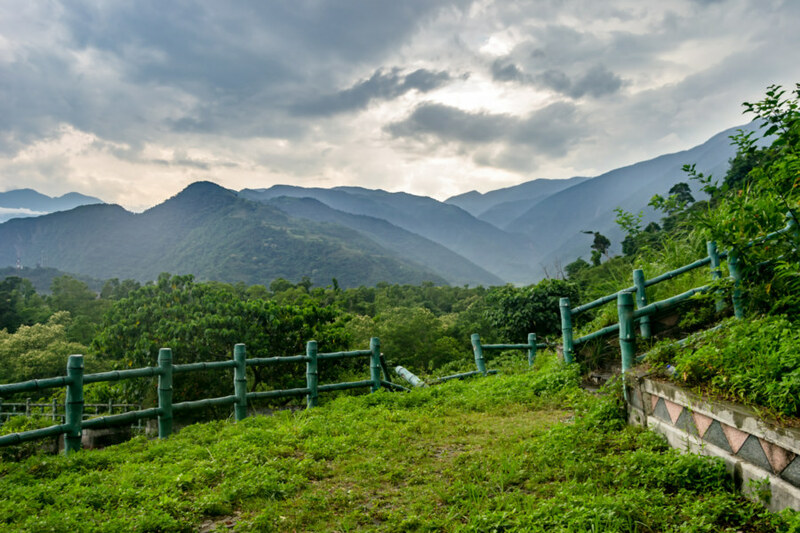 Soon I came down from the winding mountain roads and found myself on the edge of Wǔtǎ Village 武塔村, a settlement populated by the Atayal people 泰雅族, the third-most populous of Taiwan’s indigenous groups11. Here I stopped to examine a roadside monument, Sayon’s Bell 莎韻之鐘, a modest bell tower gated by another torii. At that time I wasn’t sure what it was all about—but having done some research into it, there’s quite a story to tell. Flashback to 1938, not long after the outbreak of the Second Sino-Japanese War, when a Japanese schoolteacher working in Wuta received a notice drafting him into the military. In those days the village was located approximately 20 kilometers deeper into the mountains12 and could only be reached on foot so some schoolchildren volunteered to help their teacher carry his luggage into town. A typhoon struck while the party was coming down from the mountains and a 17 year-old Atayal girl, Sayun Hayun, was knocked off a bridge by surging stormwaters, never to be seen again. None of this was accidental, of course. Japanization accelerated in 1937 with the advent of the Kōminka movement 皇民化運動, a set of policies intended to further assimilate Taiwanese, and there was obviously an interest in showing rapid progress since the disastrous Wùshè Incident 霧社事件 of 1930, in which more than 600 indigenous people were killed in a brutal crackdown. The colonial authorities recognized the propaganda value of Sayun’s story, intentionally crafted a persuasive narrative, and produced media to influence the population. 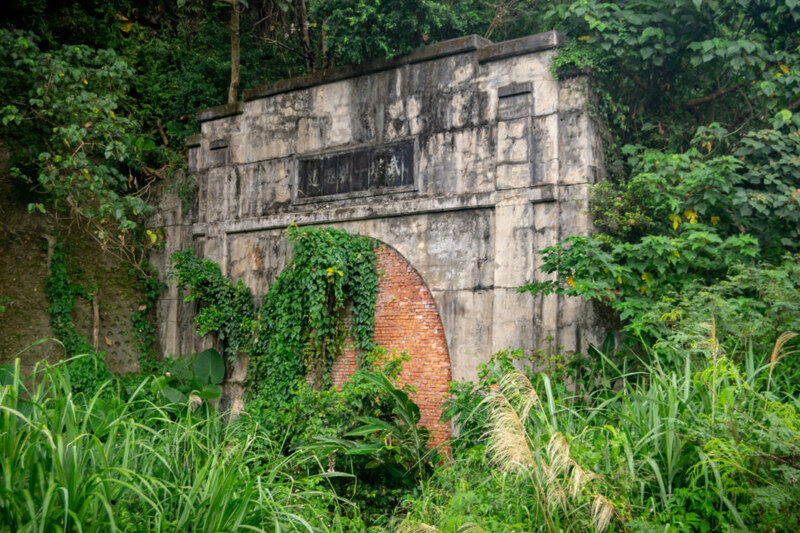 One of two old railway tunnels bricked up and left to the elements just beyond Wuta Station 武塔車站. These would have been constructed in the 1970s as part of the North-Link project and more recently bypassed by a railway improvement project. This is the Wuta No. 1 Tunnel 武塔一號隧道. The original bell and accompanying monument were destroyed sometime after the arrival of the KMT but the story was not forgotten. 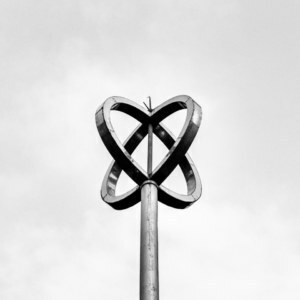 Following the democratization movement of the 1990s the bell was recast and the municipal government built the present structures, the bell tower and a torii, at what is officially known as Sayun Memorial Park 莎韻紀念公園 in 1998. What motivated people to recreate an artifact of imperial wartime propaganda in this place? You could write an entire thesis exploring this question so I won’t provide any trite answers here; it’s a topic deserving of further thought and consideration. 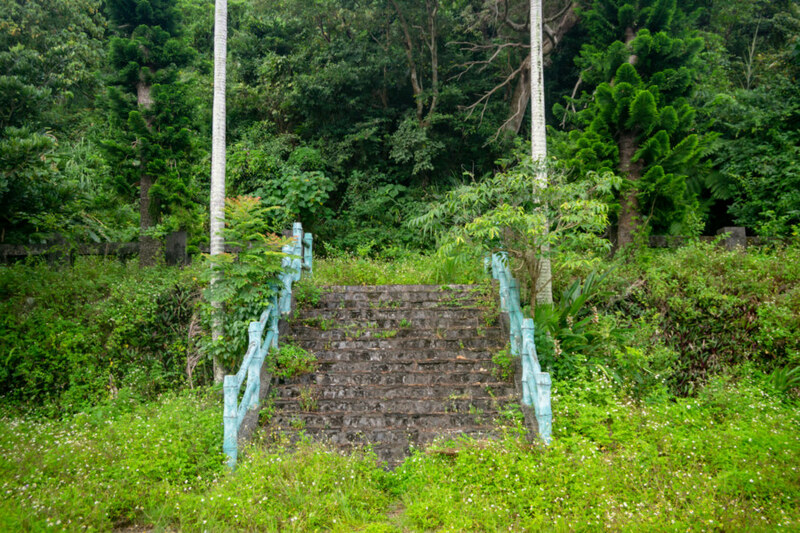 The former Shinto shrine in Nan’ao. Not much remains. Looking south from the former Shinto shrine in Nan’ao. My next stop was the former Nán’ào Shrine 南澳神社, originally built in the mid-1930s and located just a little north and west of the station on a south-facing hillside. Not much remains of this shrine apart from an overgrown stairway; I could not locate a pedestal, stone lanterns, or anything else at all really. Obviously the former shrine has been renovated at some point in the past—just look at those tacky railings—but the park is not well-maintained. 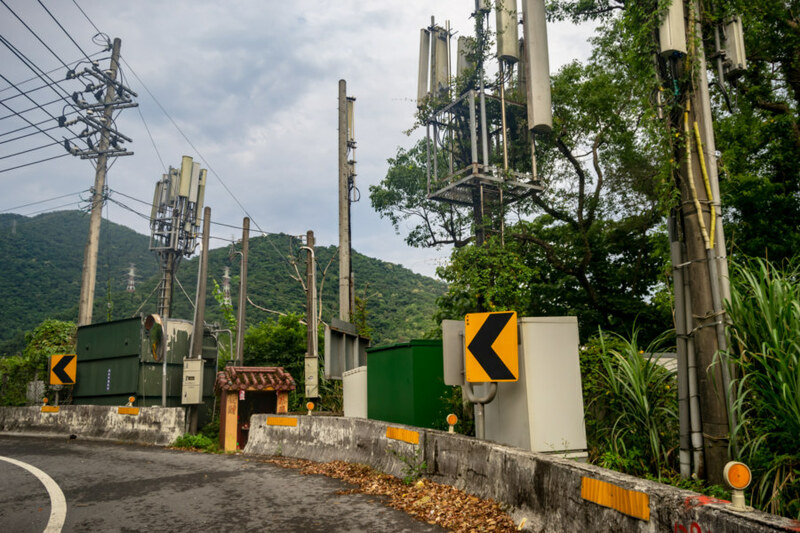 Modern infrastructure and ancient traditions: look closely and you’ll notice a small land god shrine next to these cell towers at a bend in the highway outside of Nan’ao. A shrine to the builders of the road, a rare example of Japanese people venerated in a Taiwanese temple. Not long after passing the small town of Dōng’ào 東澳13 I stopped at a roadside temple venerating construction workers and engineers who died while building the Suhua Highway. Formally known as Qìng’ān Hall 慶安堂, and less formally as Kāilù Xiānfēngyé Temple 開路先鋒爺廟 (roughly: “Road-Building Pioneers Temple”), it was constructed in 1997 to house Sōnan-hi 遭難碑 (“Accident Monument”), a stone memorial dating back to 1917. 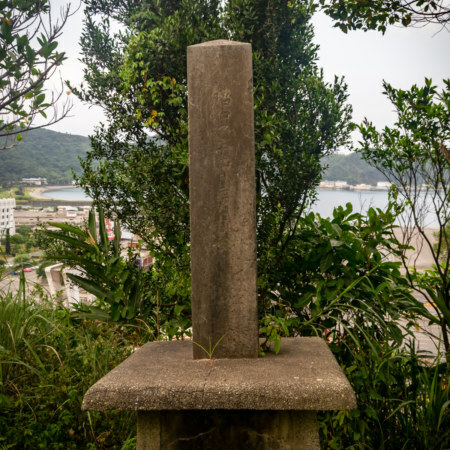 This stone originally featured two names but the list has grown to 13, several of them Japanese, making it one of a very small number of Taiwanese temples where Japanese people are worshipped14. This list is by no means complete; many other monuments to victims of accidents and disasters can be found all along the length of the highway, but this one is the oldest15. 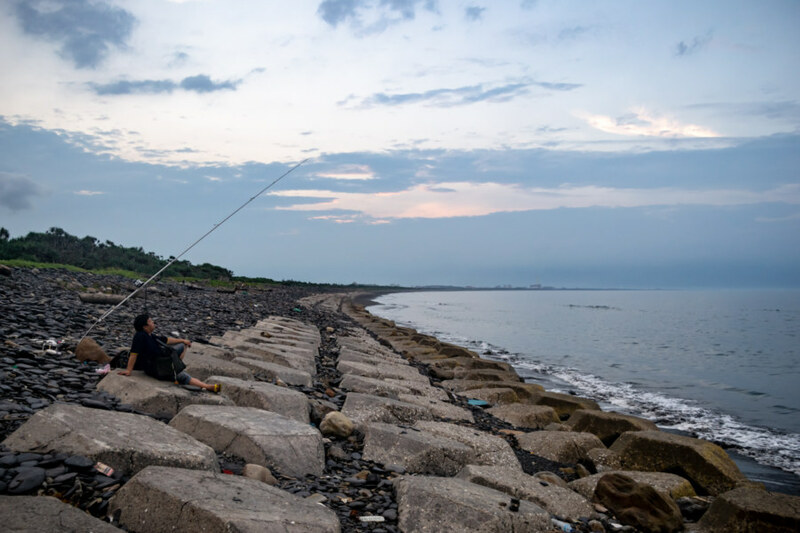 Overlooking the scenic Nanfang’ao Harbour, still one of the nation’s busiest fishing ports. With daylight running out and storm-clouds lingering over the mountains to the west I was glad to reach the Nánfāng’ào Lookout 南方澳觀景臺, the last major stop on the highway before coming down into Su’ao proper. 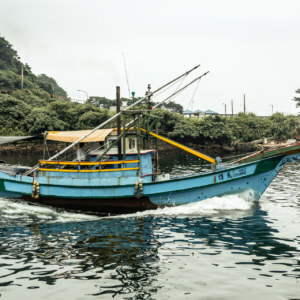 Nanfang’ao remains one of Taiwan’s most important fishing ports, and it’s one I’ve previously covered on this blog—just have a peek at this full post for more. But the day was not quite over, and I made good use of my remaining time. An oblique view of the harbour from the side of Fortress Hill. Beyond the lookout I finally left the Suhua Highway by taking an overgrown access road to the top of Pàotáishān 砲台山 (literally “Fortress Hill”), which occupies a strategic position overlooking Su’ao Harbour. 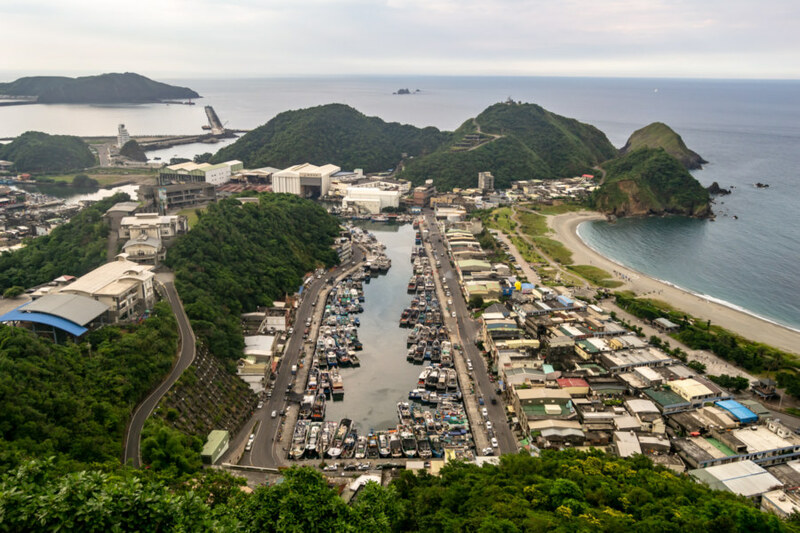 Its name is derived from a Qing dynasty fortification originally constructed here in 1884, during the Keelung Campaign of the Sino-French War, and expanded in 1889. Nowadays there is a small park on top of the hill with a recreation of the original fort, which was destroyed long ago, and a pair of cannons, provenance unknown. 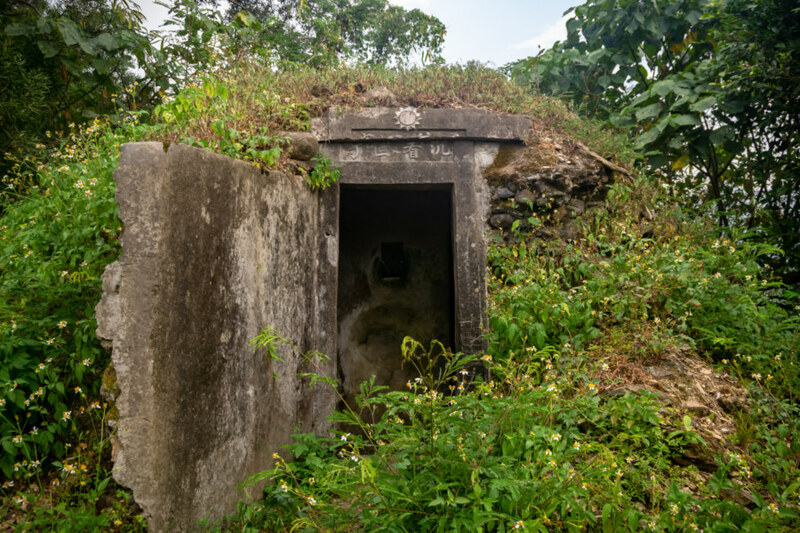 An old military bunker on Fortress Hill showing signs of recent occupation. Immediately before arriving at the hilltop park I paused to investigate an old bunker by the roadside. Emblazoned with the white sun, a KMT emblem, it probably dates to the post-war period, although I haven’t been able to find any credible information to back this up, nor was able to find a match for the characters above the entrance (chénkàn gùshǒu 沉看固守, something along the lines of “quietly watch and strongly defend”). Much to my surprise, the bunker was occupied! After entering with a flashlight I saw a man sitting in the darkness, completely still and obviously afraid. Without making eye contact I retreated, shouting apologies in English and Chinese, and drove off. I figured he’s probably a runaway fisherman, fleeing the abuse and exploitation endemic to Taiwan’s notoriously inhumane fishing industry. I wouldn’t date mention this were it not nearly a year since I was there—surely he’s moved on since then. The former Shinto shrine on Fortress Hill from below. 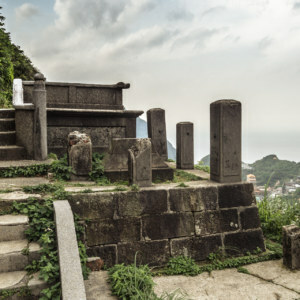 Fortress Hill is also home to the ruins of the Su’ao Kotohira Shrine 蘇澳金刀比羅神社, named after Kotohira-gū 金刀比羅, a famous shrine in Shikoku, Japan, widely revered for protecting seafarers and fishermen16. This is one of only a handful of Kotohira shrines built in Taiwan17, possibly because they were privately-funded rather than state-sponsored. 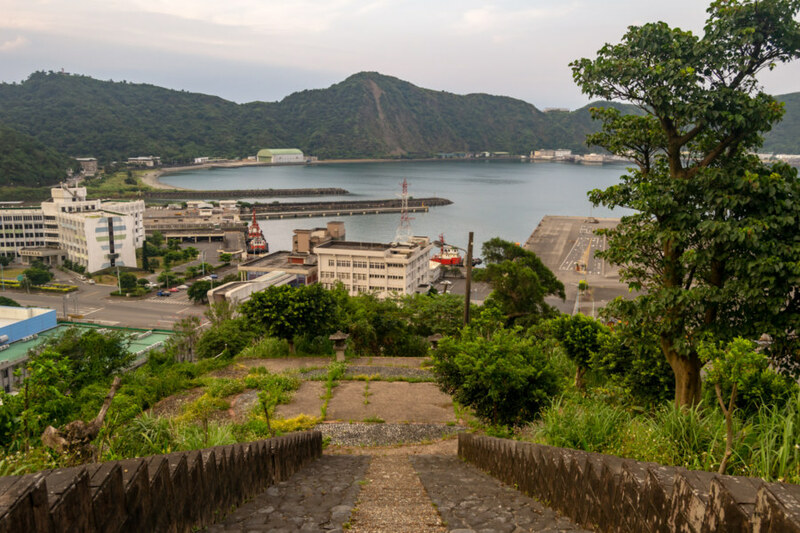 As you might expect, the shrine was oriented toward the sea, and the top of the visiting path affords a fantastic view of the harbour. 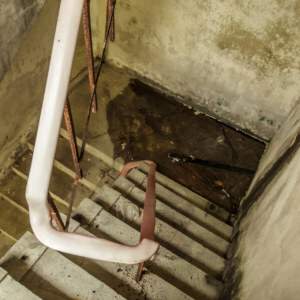 This stairway leads to the top of Fortress Hill and the former Qing dynasty gun battery. The view from Fortress Hill. The old part of Su’ao is on the left; Nanfang’ao is out of sight to the right; across the harbour are various port facilities, and if you follow the coastline to the right, numerous military installations. 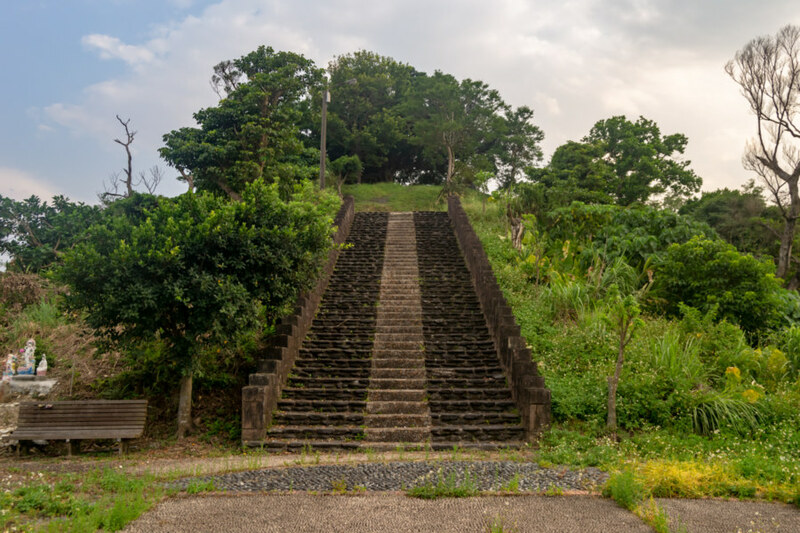 The former entrance to the shrine was destroyed to facilitate the widening of the Suhua Highway, which snakes around the base of the hill, so the stone stairway is only accessible from the top. Clamber down a level and you’ll find some stone lanterns and a monument obscured by the overgrowth. This monument is a dedication stone with a surprisingly legible inscription—usually these are defaced—reading: 昭和二年四月二十日鎮座 (established on April 20th in the second year of the Shōwa period, 1927). 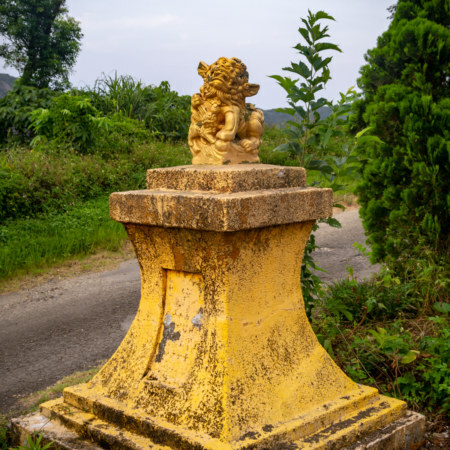 The pedestal that once supported the honden can be found in the park, but it now features a monument to the Su’ao chapter of the Lions Club. Further down the access road leading down the hillside is Tiānjūn Temple 天君廟, reputedly the location of the original Qing dynasty military encampment, and several more stone pedestals taken from the Kotohira shrine18. The old railway turntable next to the harbour in Su’ao. Before leaving town I captured a photo of the derelict Su’ao Railway Turntable 蘇澳扇形轉台, a relic of when Su’ao was the last stop on the line19. I’ve already covered the function of such turntables at length in my full post about the Changhua Roundhouse 彰化扇形車庫, so browse on over there if you’re curious about how it operated. Such turntables were necessary in the age of steam but no longer serve much of a purpose. From the look of it you might expect there to have been another fan-shaped garage at this location but I’ve seen no evidence of this, and US military maps of the area show nothing more than a railroad yard as of 1945. On the forlorn streets of Yueming New Village at dusk. With only a little light to spare, and having miraculously evaded the rain, I headed north through Lányáng Tunnel 蘭陽隧道 to have a quick look at Yuèmíng New Village 岳明新村, one of approximately 35 settlements of refugees from the Dachen Islands 大陳群島. These islands, now part of China, were evacuated by the KMT in 1955, a story detailed in this brief post. 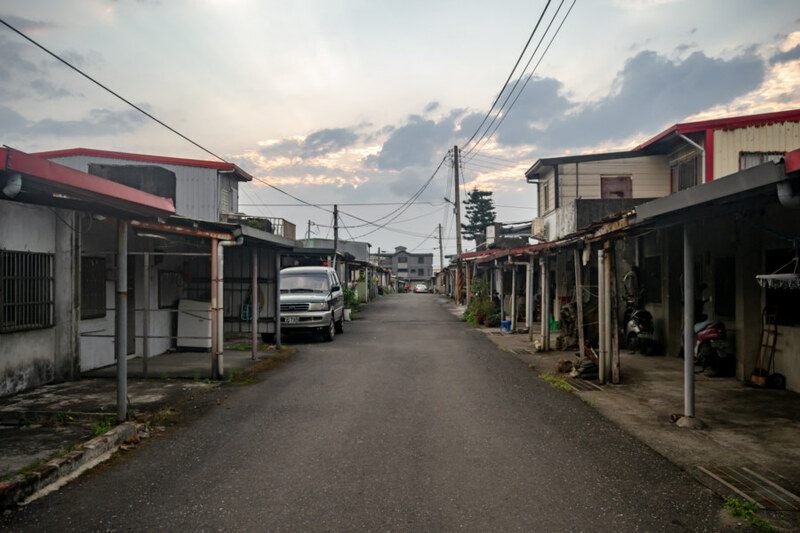 As with most other Dachen villages I’ve visited this one was quite rundown and nearly empty. I continued on to the far shore north of Su’ao Harbour and snapped the final DSLR photo of the day, having put 100 kilometers of road behind me. There was one last surprise in store for me on this ride. While heading west out of Yueming New Village into the outskirts of a small Hakka village named Gǎngkǒu 港口 (in English we’d have called this place “Portsmouth”) I noticed something interesting by the roadside. 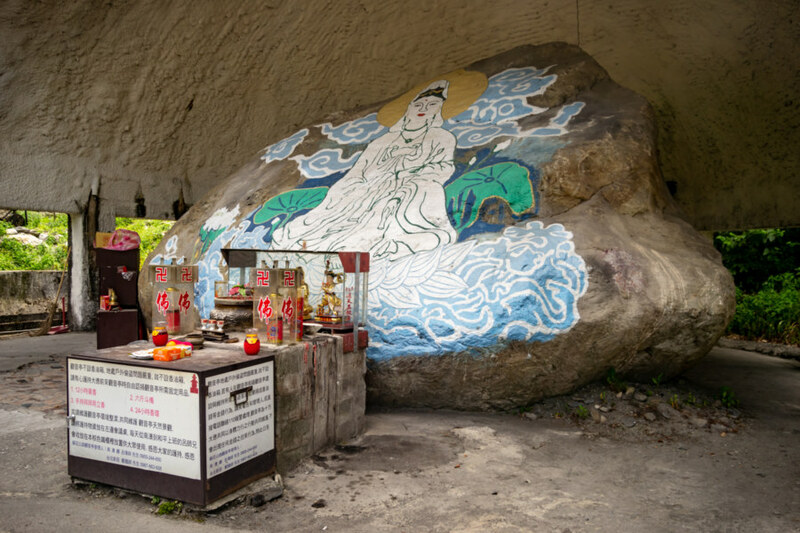 It was a small stone slab shrine, the kind where you’d ordinarily expect to find a land god, so I was taken aback at the sight of a red-faced figure wielding a comical knife in the gloomy interior. An unusual manifestation of the Five Barracks tradition; in this case, what you see here is a representation of the southern encampment of a spectral army guarding a small village in Yilan from evil and harm. Stopping to take a closer look, I realized this was one of the Five Cardinal Armies 五營神將, a tradition introduced in this post about an extraordinary temple in Lukang. In this case, what you see here is the Southern Army 南營兵將, which I confirmed by visiting the temple at the heart of the nearby village. The five armies are distributed all around the village, ostensibly to protect it from danger. 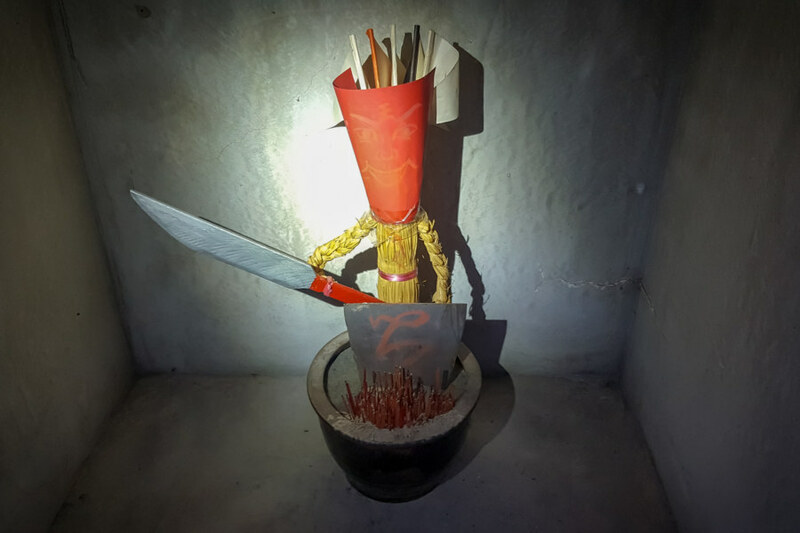 I’ve visited dozens of these little shrines all around Taiwan but nowhere else have I seen straw soldiers like these20; most feature war flags. My ride ended in Luódōng 羅東, where I snapped up an inexpensive hotel room and finally got some rest. I was hoping to continue over the mountains to Taipei the following day but ended up getting rained out, so this is the extent of my field notes from this particular trip. As usual, I picked up numerous leads while conducting research for this post, so I’ve plenty more to see should I find time to return to the Suhua Highway.